Parvati once donated Shiva to Brahma’s Sons on Narad’s advice. This happened when their second child, Ashokasundari, left home (Kailasha) for meditation. This is the story: When Kartikeya, their first child, was born, he was given to the Kritikas (some women from Kritika place). 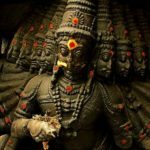 This was done because Shiva believed that by growing in that place, he would imbibe skills that would help in warfare later. 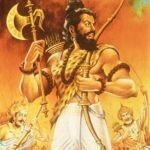 After coming to Kailasha, he immediately went to train to fight Tarakasura, one of the strongest daemons in the Hindu mythology. Shortly after killing him, he was sent to another kingdom for its protection. So Parvati was not given much opportunities to enjoy the company of her son. Similar things happened with Ashokasundari. She was shortly motivated to go for meditation. So Parvati was very upset because her family was never together. Menavati, her mother, tells her that in order to take care of this, Shiva himself should spend more time at home. So now the problem was how to make this happen. Narad to the rescue! He tells Parvati that when Sachi, the wife of Indra, was having similar problem, she donated Indra to Narad. But Narad gave Indra back to her as he couldn’t see any advantage of keeping him. Since then Indra used to spend most of the time at home. So both Menavati and Narad convince Parvati to adopt a similar method. Narad tells Parvati that she could donate Shiv to the 4 Brahma sons – Sanaka, Sanatana, Sanandana and Sanatkumara. The donation actually happened, but contrary to their expectation, the Brahma sons did not give Shiv back (who would, eh?). Then there was a massive uproar everywhere as Shiva was no longer taking care of the worldly affairs – he was now a “property” of the Brahma sons and had to obey their orders. So Parvati assumes a form of an old lady and tries to show them how the world would get devastated if Shiva was not freed. They were convinced and let go of Shiva.